On November 1st (Thu), a collaboration event of Tokyo Art & Live City "The romance of French and Japanese palace" was held in Kanze Noh Theater. Thanks to many visitors, the first collaboration event between Oji Hall, the classical music hall of fame and Kanze Noh tehater, the long-established theater of Nogaku, we could finish in a favorable reception. 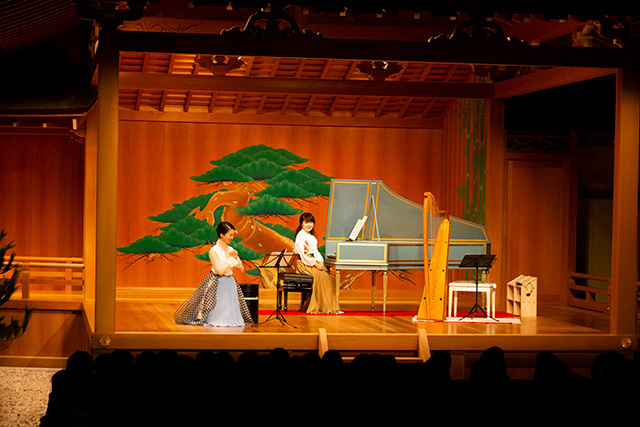 The cembalo and harp tones resonated in the audience, and Sumika Nono read in a dignified dress without a little sense of incongruity blending into the Noh teater, we feel that a lot of audience could have an opportunity to feel a new potentiality of this Noh theater. Zeami left the word “Should know that it is good that there is no home". It means if you live in a single art, you will get tired of customers, and so you should not forget an attitude of constant changing without fear, of which I am also strongly aware everyday as a stage performer. In the project of Tokyo Art & Live City, we are trying to develop new collaborations in various forms beyond framework of each content like this performance. It itself could be exactly a new art to be born, but the most important thing is how to utilize the awareness and stimulus gained there in various fields. As the result, we think that art will change naturally in line with the flow of times. Although contents of each of theater, movie and art, gathered here were just all brought up over a very long time, at the root of art that was created over time always flows something universal of the common human world, and by combining them, there may also be an effect to be born for the first time. Tokyo is now accelerating the movement for each field towards the 2020 Olympics, but we hope that this Tokyo Art & Live City will be able to achieve further development as a new source of cultural art after the Olympics.